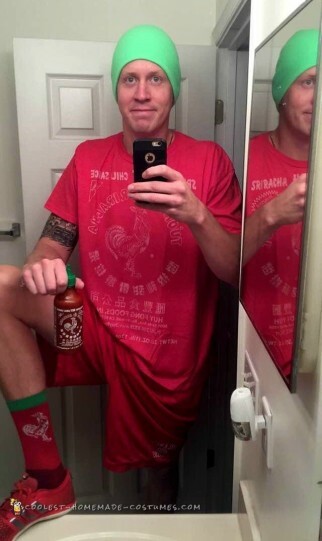 To make this siracha bottle hot sauce costume, I bought siracha socks, a siracha shirt and a neon green beanie from Amazon for under $30. I had red shoes and shorts already. Shipping took 5 days. The costume took under a minute to put on and the reaction was that people who use siracha hot sauce instantly got it and loved it. I carried the hot sauce with me all night and when anyone who wasn’t familiar with siracha asked me what I was, I showed them the bottle and they thought the costume was very clever.